BEHR PREMIUM Textured DECKOVER, more than a stain, it's an innovative solid colour coating that adds a beautiful new surface, bringing new life to old wood and concrete. Conceals splinters & cracks up to 6 mm (1/4"). Creates a textured, slip-resistant finish, available in 54 custom colours. Low VOC, 100% Acrylic, Solid colour coating; Resists cracking & peeling. Durable, mildew resistant finish; Easy, spatter resistant application. Great for concrete pool decks, patios & sidewalks. Revives wood & composite decks, railings, porches & boat docks. Multi-Surface Bonding Primer (MBP) is a single-component, water-based primer engineered to deliver superior adhesion on a variety of substrates. Works exceptionally well on substrates where proper bonding is difficult. Specially formulated with aggregates and polymers to promote mechanical adhesion on non-porous substrates. Glidden Essentials Ceiling was specially formulated for optimal performance on ceiling applications. Its high hiding formulation covers most colours with few coats and masks surface imperfections. Glidden Essentials Ceiling combines low spatter, ease of application and low odour properties and it is ideal for use on new or previously painted smooth surface ceilings and previously painted stucco ceilings. Plastic Bonder is a quick-setting, two-part, urethane adhesive system that provides strong and lasting repairs and works on thermoset, carbon fibre composites, thermoplastics, coated metals, concrete & more. Plastic Bonder has a 1:1 mixing ratio, sets in 15 minutes and can be sanded after 30 minutes. With a tensile strength of 3770 PSI, Plastic Bonder sets to a tan colour and cures to a hard, permanent bond. Behr Premium Textured Deckover , 18.9 L BEHR PREMIUM Textured DECKOVER, more than a stain, it's an innovative solid colour coating that adds a beautiful new surface, bringing new life to old wood and concrete. 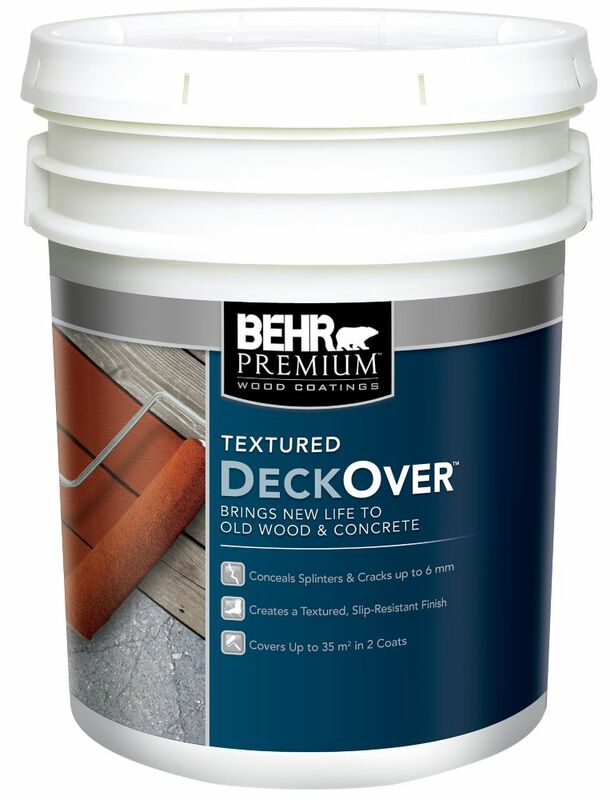 Behr Premium Textured Deckover , 18.9 L is rated 3.3 out of 5 by 694. Rated 1 out of 5 by Dunky from Don’t waste your money I followed the instructions exactly and even used the brand prep/cleaner. One year later it was peeling up in large sections. The funny part is that it adhered to new wood much better than older wood which is the intended application. As it peels up it actually traps water under it which is much worse than no treatment at all. Rated 1 out of 5 by Doug24 from Bad Product -- Do Not Buy This product is not durable or long-lasting. Within months, it will begin to flake, peel, bubble, and separate from your deck. After one winter, if not sooner, you will be regretting your purchase. It does not matter if it is a high traffic area or not. Even areas with little to no traffic will see extensive flaking and bubbling. It also does not matter how much time you spend preparing the deck for application. Even after using Behr's All-In-One Wood Cleaner, scrubbing with a stiff broom, power washing, etc. we are seeing these terrible results. This product was a complete waste of time and money. Rated 1 out of 5 by Jill33 from DeckOver Paint Bought this Product from Home Depot August of 2018. Tre did our back deck and front porch. Back deck was new wood and we did prepare it prior to painting it with. The front porch was not new wood. As you can see from the pictures the back deck is awful and the front porch isn’t! Rated 1 out of 5 by Debbiem from I wish I could put zero stars I have a very large deck, put the deckOver over beautiful new boards, and within two years boards were rotted, the railings were rotted, bought 10 gallons of this paint.. Currently spent 2 weeks trying to strip the paint from the boards.. this paint is coming up in sheets in certain spots. Customers beware!! Do not put this on your deck it’ll ruin it within a year!! Rated 1 out of 5 by catpch from ruined my deck I bought this about 10 months ago and let's just say I would never use it again. My deck is beginning to peel and now I am going to have to redo the entire front and back deck. Just a waste of money and alot of time!! !